When I wrote my original post sharing the look I went for while decorating Ruby's room: A Dreamy Nest for Ruby, I didn't actually realize how many projects I did in such a short time (it was my goal for July to get the room prepared for her August 8th arrival- which ended up being an August 2 surprise.) There ended up being far too many for one post, so I was only able to detail DIYs 1-3. 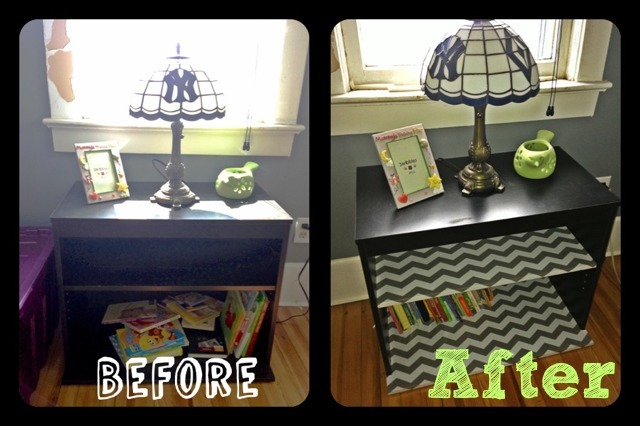 Here's the 2nd of 3 installments to finish up some of the cheap and easy crafts I used to keep my second little girls nursery on a budget. This next one is my FAVE as it only cost me $11.99 and took about 10-15 minutes. 1. The top shelf just sits on pegs so I just took it off, held up the liner against it to get the height and width (plus an inch to curve around the front edge as sow in image 2,) and cut along the grid line. 2. With the backing still on the liner, next I folded it around the front edge an creased it. 3. Finally to adhere it to the shelf, I pulled back just the edge of the backing, lined it up and stuck it down, continuing to pull off the backing as I smoothed. *This is key to applying it smoothly and easily, instead of pealing the whole liner off the backing like a sticker. Big pieces can be hard to handle once the backing is off. 4. Fold over the front edge. Image 4 shows the bottom of the shelf (and Violet's little face :) The best part about thus stuff? If you cut it a smidge too big, fold it over! Voila! So easy! The only difference with the bottom shelf is that it's not removable, so I had to reach in there, but it was still easy peasy. I can't wait to use the rest of it around the house. I will definitely be ordering some different patterns in the future too. Back to the banner...I made a triangle stencil out of paper so that I could trace and cut out the same size for each letter. This is a bit tricky since burlap frays so easily, but in the end that's why I hot glued them onto fabric backing. I also made stencils for the letters out of some oak tag, and used a sponge brush to layer some orange and green designs from some fancy stencils I already had. 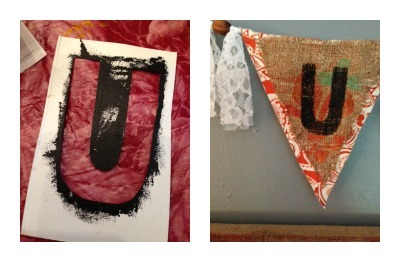 Once they were dry, I stenciled the letters right on top!. All that was left at this point was picking the fabric backing for each letter, hot gluing the pennants and assembling it all! I chose to use hemp rope to string them, and just hot glued it behind the top edge of each triangle, leaving a bit of room for some lace that I tied on, and a wooden bead in between. 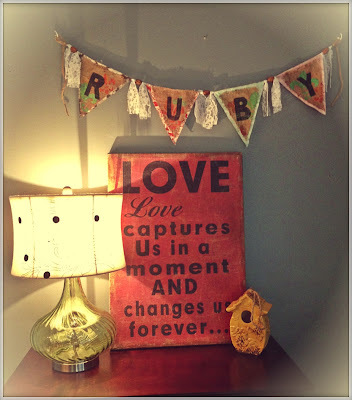 These name banners have become increasing popular and I'm seeing them in nursery decor all over the place. I made mine for a grand total of $0 with the scraps I had laying around my studio, but a cute alternative could be made with scrapbook paper! If you want to get the weathered look, but don't have burlap, crumple a brown paper bag over and over again, iron it flat (under a towel, low heat!) then back it with your choice of patterned paper, or even keep it solid! Have a few bucks to spend? Head over to Etsy and search "name banners." There are tons of beautiful options ranging anywhere from $12 to $45, but if you're like me, it's hard to justify spending money on something you can DIY! 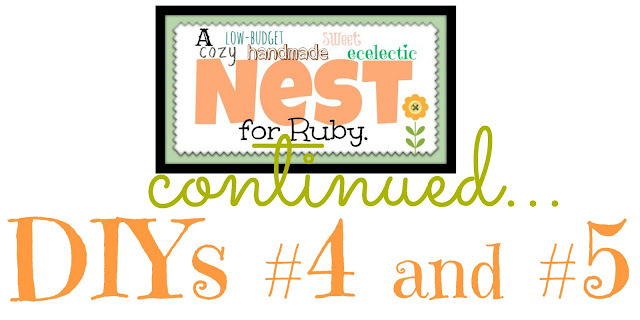 I hope you enjoyed the second installment of Ruby's Nursery DIYs on a Budget! I hope you'll come back for round 3 where I'll describe how I made a knock off Anthropologie fabric letter and trim for my existing black Roman shades, all without even touching a sewing machine. Super cute shelf liner! 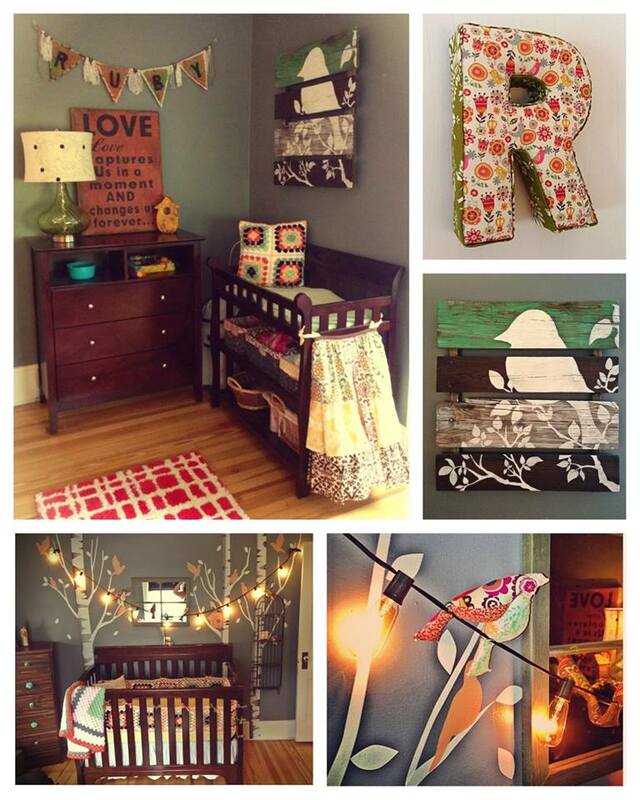 I want to do that with my shelves. They really dress a plain dresser up. It seriously took 10 minutes and I'm pretty sure I'm going to be able to use all the extra a million different ways! this household is lucky to have such a savvy mom. Can you come to my house? Just get on the plane and come. :) ALSO, i will soon be doing a post on prayer flags which I think you will LOVE because it kinda reminded me of the burlap flag. AND i saw a pin on pinterest talking about what you could do to prevent burlap from fraying. 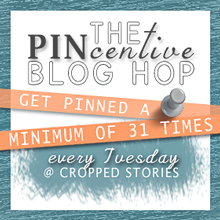 I pinned it because I am a secret burlap LOVER! I have tons in our apartment that I am itching to use!!! See? This is why we're kindred spirits. I don't think there has been a convo we've had (in person or via the interwebs) that I'm not like, "Omg me tooo!" ie: loving burlap. And prayer flags. Soo pretty. Thanks so much! It really is super easy to make! Ooooh...I love the shelf liner. So simple, but it looks so good when done! I'm going to have to find some shelves to make over! :) Thanks! Hey Nancy! Please share if you do! I wish I had thought to use it for a million different past projects. It is so versatile! It all looks so great. Wonderful decision on the shelves. They look awesome. That is a really neat way to revamp an old shelf too! I have a wooden kitchen cart that I use to hold the living room tv, dvd player and all the games. It's just the perfect size, but about 7 years old and lived through 4 kids abusing it. 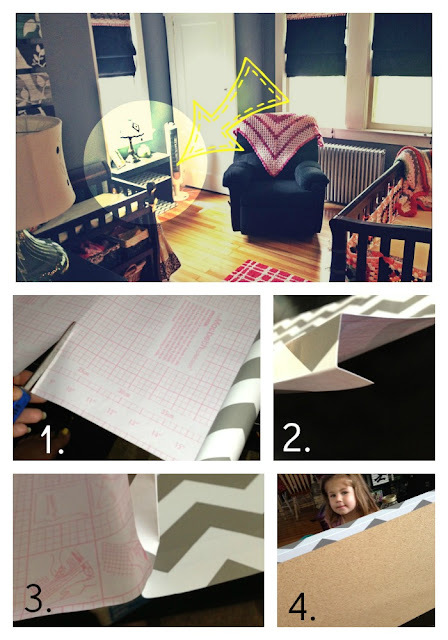 I think I will paint it and find some super cute paper like that...great idea! 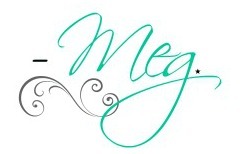 I love the name banner it looks like something I would've had to get out of a specialty store!...and ummm Ahem! 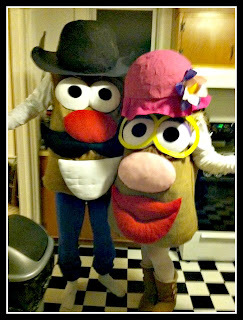 I can't wait to see how to make Mr and Mrs Potato Head...LOL Great Post! I love the DIY shelf makeover. It is a great way to update a plain shelf. Thank you for sharing.